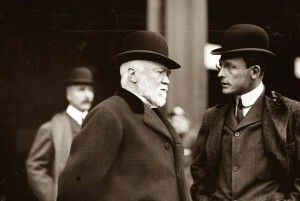 Andrew Carnegie: Forced — forced — to live in luxury! Being rich is a side effect of making money. That may sound like an absurd statement, but not when describing Andrew Carnegie, second richest man who ever walked the planet. The trappings of the Gilded Age never quite suited the wealthy steel magnate, who nevertheless owned one of the finest homes in New York City. Desiring a dwelling that would be “most modest, plainest and roomiest house in New York,” he had this simple shanty — all 64 rooms of modest, plain, expensive opulance — built in 1901 after his retirement on 91st and Fifth Avenue. At the time, 91st Street was far uptown from the clog of ‘normal’ wealthy folks congregating in their mansions on the streets between 60th and 70th. Because it was considered so far uptown, Carnegie was able to build big (on 30,000 square yards) and relatively cheap. However, because Carnegie has always been a trendsetter, other millionaires soon mimicked his example, so that his initial ‘solitude’ up on 91st spawned an entire district of elegant homes, now called Carnegie Hill. In comparison to the lavish (some would say tacky) excesses of his future neighbors, the Carnegie mansion is generally restrained, if calling any place with 64 rooms ‘restrained’ isn’t patently ridiculous. But according to Avenue Magazine, Carngie didn’t show such restrained with its technological features, installing such state-of-the-art featurse as a water filter system, the first residential elevator, and a rather sophisticated ventilation system akin to an early form of central heating and cooling. During his years at this home, Carnegie devoted most of time to giving away his money — to libraries, universities, even church organs. (The guy loved organs; his home had a massive one with pipes three stories tall.) 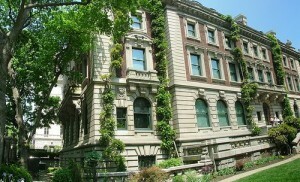 Carnegie died in 1919, but his wife remained in this large house until 1946 when it became the headquarters of the Columbia University School of Social Work. 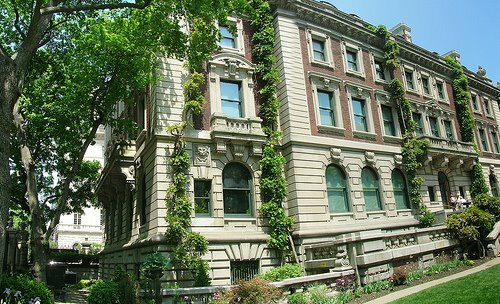 It of course lives on today as the Cooper-Hewitt National Design Museum, who took over in 1976. (A collection, incidentally, originally conceived by the descendents of two other very prominent New Yorkers — Abram S. Hewitt and Peter Cooper.) Could you imagine your home becoming an official Smithsonian Museum in the future?